The troubles of the 28 members of Kerala Strikers, the celebrity cricket team, who were deplaned at Kochi airport by the Commander of a Kochi-Hyderabad Indigo Airlines flight, are far from over. If the Indigo Airlines Commander is to follow proper procedure, there are every chances for all the Strikers to get booked soon. And if the charges are proved, they might get a punishment of one year imprisonment and/or a fine of Rs 5 lakhs. It was aboard Indigo Airlines Kochi -Hyderabad Flight 314 that the drama unfolded on Friday afternoon. As per the media reports, while the air hostesses were busy giving flight safety demonstration inside the aircraft, just before takeoff, the Strikers clapped and whistled loudly. Some other passengers said to have objected the behavior of the team. Feeling offended and insulted, the cabin crew rushed to the Captain and complained. The Captain in turn informed the ATC and brought the aircraft back to the apron and ordered the celebrity cricket team out. Clapping is of course no crime. But disturbing the crew of an aircraft definitely is. Especially when the crew were performing a crucial duty directly related to the safety of the aircraft. which is likely to endanger the safety of the aircraft or of any person or jeopardizes the good order and discipline on board the aircraft. b) refuse to follow a lawful instruction given by the Pilot-in-Command, or on behalf of the Pilot-in-Command by a crew member, for the purpose of ensuring the safety of the aircraft or of any person or property on board or for the purpose of maintaining good order and discipline on board. If the Kerala Strikers indeed had clapped and whistled while the safety demo was on, it is obvious that they are guilty of violating the above rules. Now, can the Commander decide to not to proceed further with the issue? As per a circular (F.No. AS/CABIN SAFETY/CIRCULAR/2010 CABIN SAFETY CIRCULAR NO. 2 OF 2010) released by DGCA on 27th January, 2010, it is mandatory for the Commander to report such incidents without any delay. All incidents are to be reported to Director Air Safety – Headquarters (Cabin Safety Division) and in addition to Director Air Safety / Regional Controller Air Safety in whose region the flight lands after the incident. The information is to be immediately reported by Chief of Flight Safety/Cabin Crew Nodal Officer (telephonically) as above and written information should be submitted within 12 hours of the landing of the aircraft as per the enclosed performa. The penalty too is there in the rules. See schedule VI of the Aircraft Rules 1937 . Offences punishable with imprisonment for a term not exceeding one year or with fine not exceeding five lakh rupees, or with both. The operations website, airindiaops.com, that Air India has been maintaining for the last 14 years is now down for 17 days. Reason: The national carrier could not renew the site before the date of expiry, 2013-11-15. The site, which was the only online source of information regarding crew rostering, training schedule, advisories, announcements etc was a sort of intranet site used religiously by thousands of cabin crew, pilots and ground staff from across the globe. The applications for leave could filed through this site, incidents could be reported and the full duty schedule for the next week could be downloaded. Now the crew get this pagewhen trying to login. airindiaops.com expired on 11/13/2013 and is pending renewal or deletion. And now any one can bid for the domain. Minimum bid amount is $647 and starting bid was 69 $USD. And be quick. The bidding will close on December 18. The recent awarding of Environmental Clearance for the controversial airport project at Aranmula, Kerala, is nothing less than a joke. And what the Ministry now permits to build? That is, the total length of the runway basic strip is only 1000 m. Because it is mandatory to leave 90 m on both ends of the runway as RESA (Runway End Safety Area), the total effective length of the runway will be 180 m less. So what is the length of runway KGS people are actually getting instead of the 2800 m they asked for ? And what kind of an aircraft will be able operate from this 820 m runway? That is the most difficult question the promoters will have to find an answer for themselves- that is, if they really are determined to build an airport at Aranmula. The smallest aircraft scheduled airlines have in these parts of the world is ATR-42-300. The minimum runway length (Take off field length) required for this 45 seater turbo prop aircraft is 1040 m. But this is for a runway at sea level altitude, with no wind along the runway and with an atmospheric temperature of 15 degrees Celsius. When the temperature and elevation are higher, runway length required would be more. With wind also, the aircraft would require to run longer. So the only option left for the airlines would be to operate the ATR with a load penalty – that is with reduced capacity. And in India, how many airlines operate ATR-42-300 aircraft? The maximum distance the aircraft can fly non-stop is only 840 Nautical Miles (1556 km). So there is no question of international operations. And can KGS expand the airport after a few years of operation, so that airlines could operate aircraft like A300 from here to foreign destinations? So what really the M/s KGS Aranmula Airport is getting in the end? A very small airport with 820 m runway from which only Air India operates a few domestic flights. The Terminal building will also be too small because the maximum number of passengers the airport will be handling per day will be some 60-80. .. Promoted by KGS Aranmula International Airport Ltd, the Rs 2,000-crore project has witnessed stiff resistance from both the political Opposition and environmentalists…. For the first phase, 500 acres of land have been acquired. Work will start soon and the airport will be ready for commercial operations in December 2015. There is no compulsory eviction of even one cent of land, George reiterated. All land acquired has been bought at market price. An integrated airport city will be developed with a Special Economic Zone. A multispecialty hospital, shopping mall, hotels and an international school are the other planned facilities. George said Malaysian Airport Holdings, Emirates, AD Paris and Changi Singapore are being invited to bid for airport operation. The airport’s ‘influential zone’ will be close to multiple tourism destinations such as Kumarakom and the backwaters of Alappuzha. It is only an hour away from Sabarimala, the second largest pilgrim centre in the country…. Hijack or no hijack, it is next to impossible to prosecute any of the passengers who were aboard the controversial Air India Express Flight 4422, on October 19, 2012, on the basis of Aviation rules of the land. The conviction on Thursday of a Chartered Accountant who three years back had caused a hijack scare aboard an Indigo Airlines flight, makes this all the more evident. On February 1, 2009, Jitender Kumar Mohla (45) announced aboard the Indigo Airlines flight that was flying from Delhi to Goa that he was hijacking the aircraft. Though he was accused of trying to hijack the aircraft, Mohla is now convicted not under Anti-Hijacking Act, but section 3(1)(d) of the Suppression of Unlawful Acts against the Safety of Civil Aviation and 336/506/170 of the IPC. He got acquitted of charges under the Anti-Hijacking Act as “nothing incriminating was found in his possession when he was arrested. And there were no evidence on record to show that the accused entered the cockpit”. Now let us examine again the ‘hijack’ case of Air India Express Abu Dhabi – Kochi Flight which landed at Thiruvananthapuram on October 19 morning after being diverted from Kochi. The passengers got agitated when the Pilot made the announcements that they had to make their own arrangements to reach Kochi and that she was leaving the aircraft because her flight duty time limit was exceeded. The furor that followed ended in the Pilot sending an emergency transponder signal and telling the Control Tower that the situation was ‘Hijack Like”. It was already made evident that, because the aircraft was not in flight, the Anti-Hijacking Act, 1982 could not be invoked. 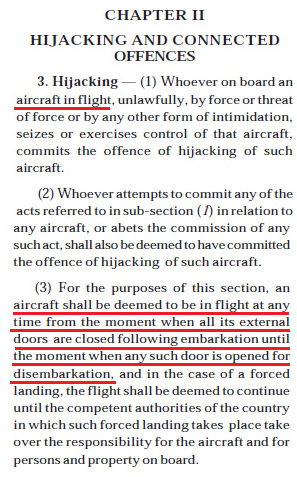 The only remaining act applicable is “The Suppression of Unlawful Acts Against Safety of Civil Aviation Act, 1982”, just as it was for the Mohla case. 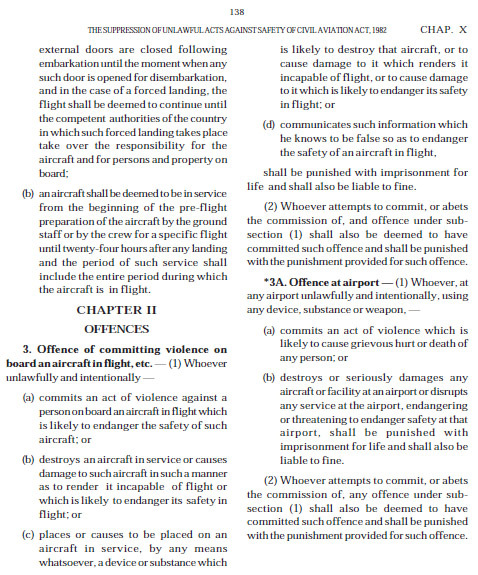 (d) communicates such information which he knows to be false so as to endanger the safety of an aircraft in flight, shall be punished with imprisonment for life and shall also be liable to fine. (2) Whoever attempts to commit, or abets the commission of, and offense under subsection (1) shall also be deemed to have committed such offense and shall be punished with the punishment provided for such offense. Now, (1) (a) is not applicable because the aircraft was not in flight. (1) (b) also does not come in to play because no damage was done to the aircraft. (1) (d) also is irrelevant as it deals with an aircraft in flight and no false communication was made by anyone. 4. Destruction of, or damage to, air navigation facilities. 3A deals obviously with incidents outside an aircraft and 4 is again not applicable because no navigational facilities were damaged. That means no aviation safety law is violated by the passengers . Now it is up to the local Police to invoke or not the sections of Indian Penal Code based on the written complaint of the Pilot-in-Command of the aircraft. It now has become more evident that Capt. Rupali Waghmare, the Pilot-In-Command of Air India Express flight 4422 was gravely at fault when she informed the young Controller at duty at Thiruvananthapuram Air Traffic Control in the morning hours of Friday the 19th that her aircraft was in a hijack like situation. The Boeing 737-800 aircraft from Abu Dhabi to Kochi was being diverted to Thiruvananthapuram in the early morning hours because of poor visibility at Kochi. Because the Captain, who had exceeded her flight duty time soon after landing, allegedly told the passengers that they would have to travel to Kochi on their own. The fracas then followed eventually culminated in the Captain telling the ATC over R/T that there was a hijack like situation aboard, though the transponder button She had pressed was 7700 indicator of ‘Emergency’. The Anti-Hijacking Act, 1982 (65 OF 1982), clearly indicts the Captain who deliberately told the ATC man that the situation was hijack like. Whoever on board an aircraft in flight, unlawfully, by force or threat of force or by any other form of intimidation, seizes or exercises control of that aircraft, commits the offence of hijacking of such aircraft. That means, only an aircraft in flight can be hijacked. And what is a flight? So the doors of the plane were opened already for disembarkation. A ceased flight and a nonexistent hijacking. So there never was a case against the six passengers the Pilot named in her complaint. And there never was any need for the Police to question them. And the ATC people also can never be blamed. 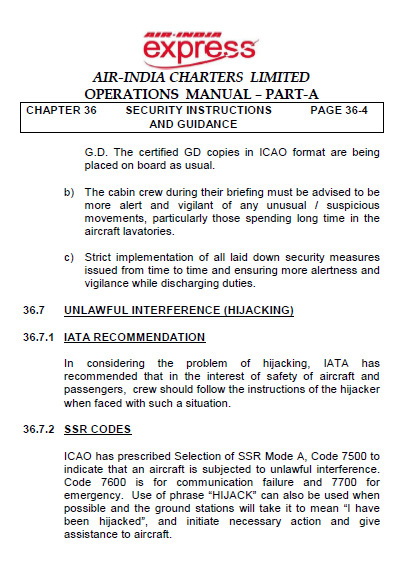 Because the Commander of the aircraft had uttered the word hijack while talking with them over R/T, they had absolutely no choice but to initiate all the actions assuming that the aircraft had already been hijacked (Directive 36.7.2 Operations Manual of AICL, Issue 1, 24.04.2012) – even if they had seen from the tower that the doors of the craft already were opened and some passengers had disembarked. If there still is a case, it ought to be charged against only one person- The PIC of Air India Express flight 4422. It is learnt that the specific usage of the word “Hijack” by Capt. Rupali Waghmare that triggered all the anti-hijack procedures at Thiruvananthapuram Airport on Friday when the Abu Dhabi-Kochi Air India Express flight 4422 she had been commanding was parked at the airport. It also has become evident that the transponder code the Captain used was not the one that indicates a hijack. Trouble started at 7 am on Friday when the flight landed at the capital city airport after being diverted from Kochi because of poor visibility. The Passengers protested on being told they would have to travel by road to Kochi and went in to agitated arguments with the flight crew. Then Capt. Rupali send an hijack alert to air traffic control, it was reported. Though the transponder code from the aircraft received by the radar at Thiruvananthapuram control tower was 7700, indicator of (technical) emergency, the young controller was being compelled to initiate the anti-hijack procedures because the captain had spoken to him over the Radio Transmitter that there was a HIJACK LIKE SITUATION on board. Because the word ‘HIJACK’ had been uttered, the controller had absolutely no choice, but to initiate the process of the post-hijack drill that eventually did cause so much inconvenience to the passengers of the plane who already had been taxed beyond their endurance. And the well experienced Captain could never have not known the implications of the word. Use of phrase “HIJACK” can also be used when possible and the ground stations will take it to mean “I have been hijacked”, and initiate necessary action and give assistance to aircraft. But then why she did not use the 7500 transponder code indicating “Unlawful Interference” or hijacking? If number two was the case, we can see that she has succeeded to an extent. Only yesterday that Civil Aviation Minister Ajit Singh vouched for her telling the media people that the pilot sounded only an emergency alert (read 7700). It is also pointed out that to handle a situation like that, there never were the need to talk to the control tower, switching on the R/T. There were ample facilities for the pilot whose aircraft was parked at the airport, to communicate with the airline’s staff or with the security personnel. But when the Captain preferred to talk with the ATC instead, the very character of the whole situation altered dramatically. It has now become clear that the Court of Inquiry that investigated the crash of Air India Express Flight 812 on May 22, 2010 had never considered a vital evidence that would have altered the very character and course of the investigation. Capt. Zlatco Glusica, the Serbian Captain of the crashed aircraft was drawn in last minute to command the flight. The flights to and from Dubai (flight No. 811 & 812) were supposed to be training flights for Capt. Ahluwalia, who was due for a hike to Commander level. In the programme, that was prepared on 13 May 2010, the name of the First Officer of the flight of course can be read as A. H. Ahluwalia. But in the column where the name of the commander was to be typed in, what appears is just three letters: TRG. TRG means training. Should be commander training for Ahluwalia. But why the actual name of the Pilot in Command was not printed? Might be because Air India Express people were undecided about the person, when the schedule was prepared. But when it was actually decided to fill that gap with Capt. Glusica? When did Capt. Glusica, who had returned to India only on May 18 after a vacation in his country, was informed of this decision? Answers to these questions are very crucial because, in their eagerness to put all the blame on Capt. Glusica, the Court of Inquiry had repeatedly stated in the report that the Captain had slept , atleast for 100 minutes, in the return flight, inspite of getting adequate rest prior to the flight. And according to the CoI, the inertia caused by that sleep was the main cause of the accident. (a) In spite of availability of adequate rest period prior to the flight,the Captain was in prolonged sleep during flight, which could have ledto sleep inertia. As a result of relatively short period of time between hisawakening and the approach, it possibly led to impaired judgment. Thisaspect might have got accentuated while flying in the Window ofCircadian Low (WOCL). (b) In the absence of Mangalore Area Control Radar (MSSR), due toun-serviceability, the aircraft was given descent at a shorter distance onDME as compared to the normal. However, the flight crew did not planthe descent profile properly, resulting in remaining high on approach. (c) Probably in view of ambiguity in various instructions empoweringthe ‘co-pilot’ to initiate a ‘go around’, the First Officer gave repeatedcalls to this effect, but did not take over the controls to actuallydiscontinue the ill-fated approach. What if Capt.Glusica was informed of the flight only some hours before? What if he had not slept for the previous day being not aware of the sudden change in schedule?What if the Captain was not physically well after the long journey back India? The scope of investigation of the CoI had never entered these zones exactly because this particular schedule mysteriously had escaped their notice. The significance of the three letters, ‘TRG’ is in addition to this. If it indeed was a flight in which the eligibility of Capt. Ahluwalia to get promoted to the post of Commander was to be checked, many of an observations and accusations the Court of Inquiry had put forward regarding the unhealthy ‘steep gradient of authority’ in flight 812’s cockpit suddenly becoming null and void. A TRG flight justifies Capt. Glusica’s decision to pay not much heed to the first officers suggestions. A TRG flight makes it clear why Ahluwalia never took over controls. A TRG flight again makes it obvious why the Commander allowed the First Officer to do almost all the R/T communications. The flying Programme of Air India Express for the period of 17/05/2010 to 23/05/2010 clearly is a new and material evidence on the basis of which a reopening of the investigation of the crash of Flight 812 can be ordered. The investigation of the 2011 May 22 crash of Air India Express Flight 812 must be reopened. The Indian Government should discard the the biased, incomplete and erroneous whitewash of a report submitted on April 26, 2011 by the Court of Inquiry and should immediately order a reinvestigation. The demand for the urgent reopening of the inquiry of the tragic crash in which as many as 158 lives had perished is perfectly in accordance to the rule of the land. On 2009 March 13, the Government of India had inserted vide GSR No. 168(E) a very important rule to ‘The Aircraft Rules 1937’, which govern everything aviation in this country. 75A. Reopening of Investigation – Where it appears to the Central Government that any new and material evidence has become available after completion of the investigation under rule 71, 74 or 75, as the case may be, it may, by order, direct the reopening of the same. The series of six articles published in Aviation India and Decision Height from May 15 to June 2011 make it abundantly clear that there are enough new and material evidence that make the reopening of the investigation absolutely necessary. All the above four new & material evidence had already been elaboarted in the articles published by us. But there still are more new evidence & facts the CoI never bothered to find out. We are publishng that new evidence tomorrow. When Air India Express Flight 812 crashed in the early morning of May 22, 2010, 158 lives were consumed by fire caused when the wing of the aircraft broke after it struck the concrete structure on which the ILS Antenna was mounted. Thanks to the ‘smoke screen’ on Page 36 of the CoI report, the fact that the structure was erected there violating all the safety norms is very well camouflaged. ICAO Annex 14, governs the Standards for Aerodromes. In Chapter 3, under section 3.5 comes Runway End Safety Area ( RESA). The Annex specifies that “ Runway End Safety Area SHALL be provided at each end of the runway strip. 3.5.2 A Runway End Safety Area shall extend from the end of a runway strip to a distance of at least 90m. 3.5.6 An object on runway end safety area which may endanger aeroplanes should be regarded as an obstacle and should, as far as practicable, be removed. At the time of accident , there was a Basic strip of 60m followed by RESA of 180m ( now reduced to 175m). After the end of the 237m within RESA, a concrete structure had been constructed on which ILS Localiser antenna is mounted. This is another clumsy attempt to cover-up a dangerous safety infringement. The figures of 180m or 175m do not appear anywhere in the ICAO Annex 14 under the heading Runway end safety area. Someone has attempted to indicate the figure of 240m ( 60 = 180 ) was provided but realised that the concrete structure was at 237m. Hence, the figure was reduced to 235m ( 60 + 175 ). A further precaution to protect a wrong structure is the falling back on the figure of 90m x 90m, which is the mandatory figure as per Annex 14 while 240 is a recommendation. 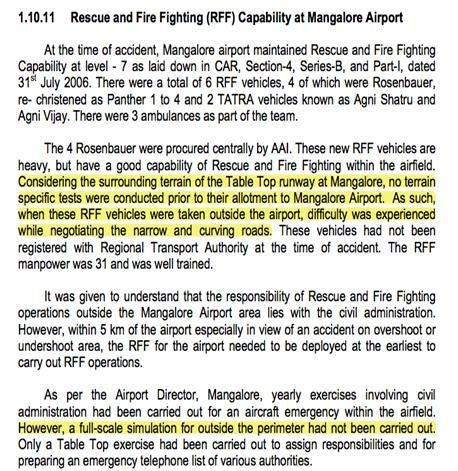 The report goes on to state : After the accident, the ILS was recalibrated on 16th June 2010. The damaged structure was rebuilt with another rigid structure within three weeks of the fatal accident ! Did they realize that the danger for all operations continue from that date? Was the DGCA right in renewing the license for the airport with this dangerous structure? SUBJECT: REQUIREMENTS FOR ISSUE OF AN AERODROME LICENCE. demonstrate the functional arrangements and their integration for provision of CNS-ATM, RFF, AIS, meteorological and security services. checking of the aerodrome facilities, services, equipment and procedures to verify and ensure that they comply with the requirements. 4.8 The aerodrome licence shall be issued by the Aerodrome Standard Dte. after approval of DG under the appropriate category, if the DGCA is satisfied that applicant has complied with all relevant requirements. In case of the non-compliance of the requirement by the applicant, licence may either be refused or granted with limitations/ restrictions / conditions as deemed appropriate by the DGCA, provided that in such cases the overall safety is not compromised. Enclose obstacle limitation charts including type ‘A’ chart for the aerodrome including the details of obstructions, which are marked and lighted. The license given to Mangalore is suspect and officials who conducted the safety audit have made a sham of the inspection. The concrete structure was definitely a hazard to flying and it is surprising if item 13.2 of the Application form was filled up otherwise. Licensing done by DGCA in 2007 and Surveillance inspection done two days before the accident. It is pure divine grace which has prevented more fatal accidents in Mangalore. 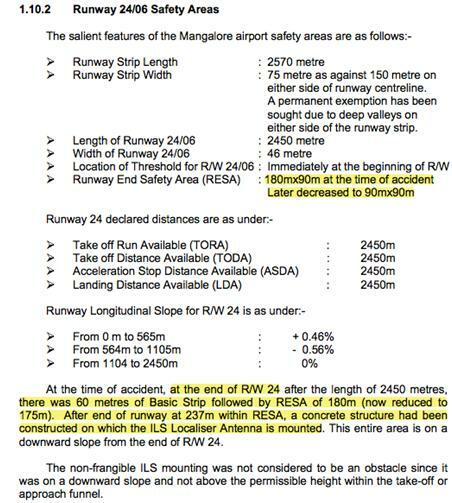 The highlighted portions of the extract clearly spells out the danger to all aircrafts operating in and out of Mangalore. The dangerous structure on which the ILS antenna is mounted is present. The Rescue and Fire fighting is not possible outside the airport perimeter. Yet, officials of DGCA and AAI have certified that the airport with the present facilities is safe! The other important factor is the fatigue factor of the Air Traffic controllers. Their shifts are designed to keep them on a continuous 12 hour duty period during the night. They are also exposed to the Window of Circadian low which would result is erroneous or delayed response. On the day of the crash, the ATCO has stated that the end of the runway was not visible and he has given instructions to the aircraft to back track as was the “ normal” practice ! The ATCO was not even aware that the aircraft had crashed ! The entire report on the crash appears to put the blame on the Captain alone. All the other agencies involved in contributing to the death of 158 persons has been blanked out in the smoke-screen. The danger persists and lessons have not been learnt. (Captain A. Ranganathan is a member of India’s Safety Advisory Committee of the Aviation. The aviation safety expert and veteran pilot has more than 20,000 hours of flying experience to his credit. Capt. Ranganathan can be reached at mohlak@gmail.com). The “ Hard Landing” circular issued by Air India is a major contributor to the accident and the COI report has chosen to ignore this vital fact. The report is completely silent on the contributory factors when it comes to the failure of the Airline, the Airport Authority of India and the Regulator. The cover up of a circular on hard landing, issued by the Flight Safety Head of Air India, has been swept aside. On page 90/175 of the report, the following statement clearly indicates the cover-up. Flight Safety counseling on one-off incident of Hard Landing by Captain for 1.9 Vg which was much less than AMM limit of 2.1 Vg cannot be considered as a contributing factor towards the accident. Having been consistently unstabilised on the ILS Approach, even if the Captain had been able to stop the aircraft on the runway, the subsequent FOQA analysis of DFDR and possibily of CVR, would have indicated various violations of SOP by the Captain. This would have, in any case, warranted another reprimand by the authorities. In a high energy and fast approach, resulting in a very late touchdown, no prudent pilot would also aim to make a smooth touchdown to avoid flight safety counseling. The aircraft in this instant had not been able to remain firmly on ground because of higher speed at touchdown and not possibly because of any attempted smooth landing. The kink marked by the bottom arrow clearly indicates that the engine thrust was increased to cushion the landing. The normal landing should have been done with idle thrust but the Flight data recorded clearly indicates that there was more than idle thrust at touchdown. The top arrow indicates the vertical profile of the aircraft. The COI has taken the sounds at 06;04;40 at the Main Gear touchdown, yet in several portions of the report , they indicate the touchdown as 06:04:41. Apart from this error, their contention that the circular on hard landing issued by air India has no bearing on the accident is faulty. 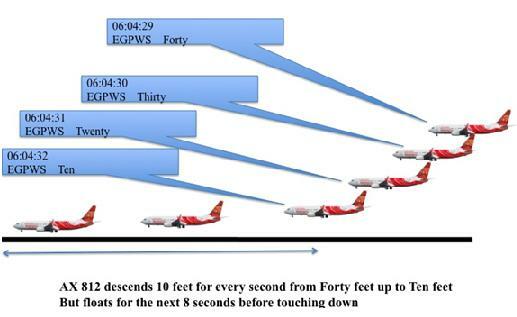 Taking the figures indicated in the COI report from the DFDR readouts, the above image is a graphical representation of what was the final profile of the aircraft. The flight was well above the ILS Glide path that it should have taken. 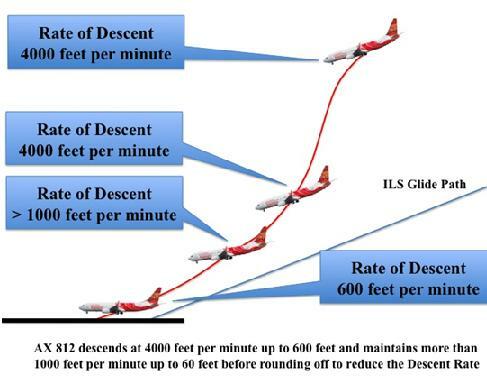 The descent rate up to one mile from the runway threshold is more than 4000 feet per minute and the captain reduces the descent rate to more than 1000 feet per minute up to 60 feet above the runway surface. The COI report mentions that the captain violated the Standard Operating Procedure which requires a descent rate not exceeding 1000 feet per minute. However, they chose to ignore the CVR and DFDR indication which clearly points to the fact that the captain ignores all EGPWS warnings and the copilots call for Go-around, yet continues to land late by flattening out the approach. This is a classic case of what is called “Press-on-It is” in aviation safety parlance. The action of the captain in arresting the high descent rate and making a smooth touchdown with power , is a clear indication that the counseling he had for the earlier hard landing was the influential factor. The “ Hard Landing” circular issued by Air India is a major contributor to the accident and the COI report has chosen to ignore this vital fact.